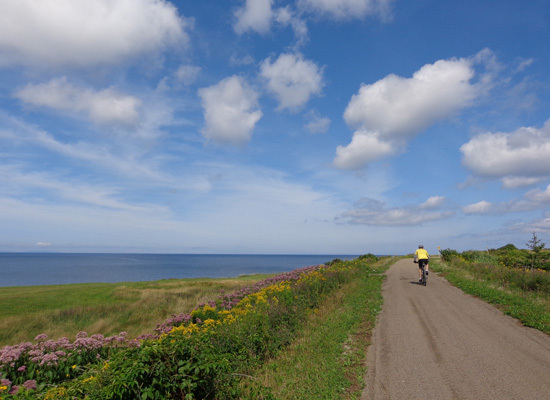 Cape Breton Island as one of 'Twenty Must-See Places' in 2013." Nova Scotia conjured up visions of beautiful mountains and coastlines, colorful fishing villages, and fascinating Scottish history well before we arrived here. I've seen pictures of the lush scenery and heard tales of the vibrant mix of cultures for several decades. It's been one of my bucket-list destinations since my brother married his Scottish-born wife, Margaret, in 1967. 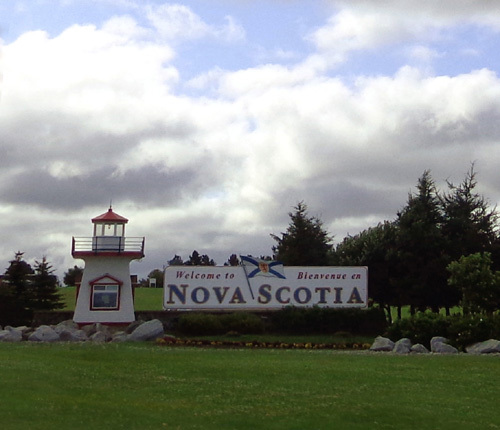 Marge is one of several people we know who have vacationed in Nova Scotia and raved about it. It reminded her of the rolling green hills of her native Scotland. Although Jim and I are interested in learning more about the history and variety of cultures in this province, we are interested even more in its scenic beauty and opportunities for outdoor adventure -- from what we've read, it's full of gorgeous hiking trails and cycling paths. 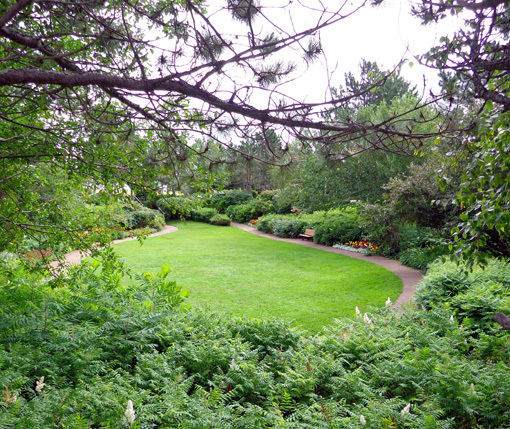 There are many other outdoor activities available to visitors and residents. Those are just our two current favorites. 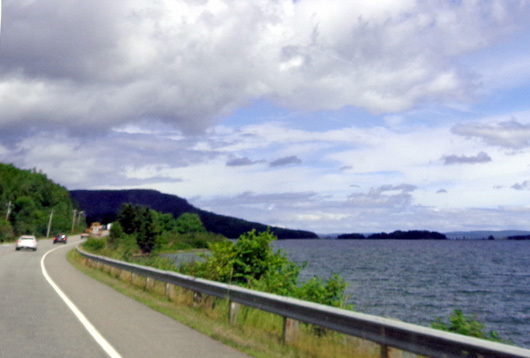 The "five scenic trails" referenced in the quote above don't mean hiking or cycling trails; they are scenic driving routes to showcase the island. We'll do one or more of those, too, as we explore as much of the island as we can on foot and with wheels in the three-plus days we are here. When choosing a base from which to go out on day trips on the island, we picked Baddeck as being the most centrally located. 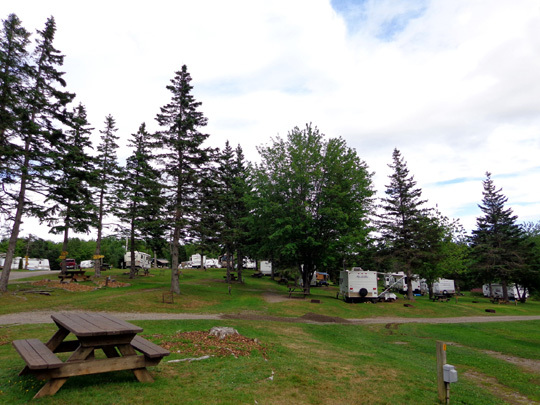 There are at least three nice campgrounds near Baddeck. I'll talk about the one we chose in the next entry. 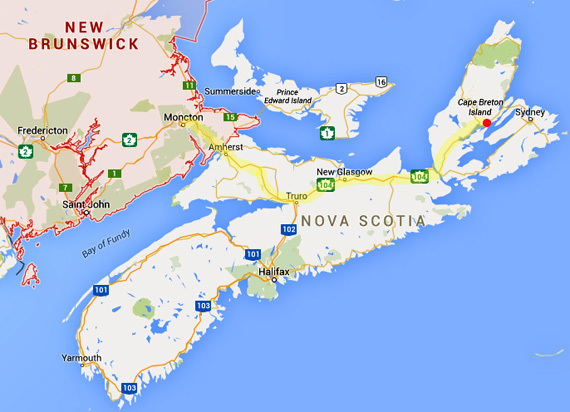 The town of Baddeck is in the upper right marked with a red dot. That's where we're staying while we explore the island the next four days. 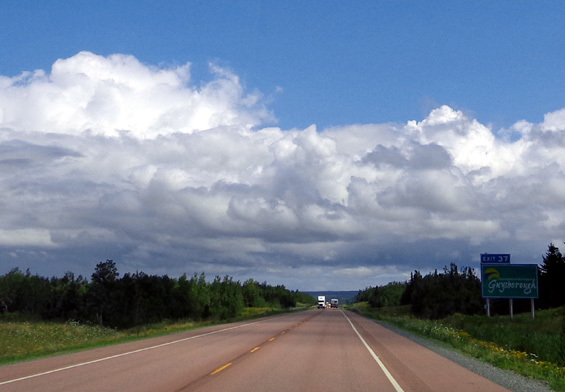 We took CA 2 from Moncton to the Nova Scotia border, CA 104 to Cape Breton, and CA 105 to Baddeck. All three are federal highways. There is a section of toll road in Nova Scotia between Amherst and Truro that goes over Cobequid Pass. Cost for cars is $4 CA and $5.25 CA for vehicles with trailers. It appears that NS 4 is an alternate route that avoids the toll road. Signs in New Brunswick are in French and English because both are official languages in that province. English is the only official language in Nova Scotia so signs are just in English here. 110 MPH??!! Not quite. That's kilometers = 68 MPH for those of us from the States. Kilometers are fairly easy for us since we're former runners; many races are measured in km's. Translating liters to gallons is trickier for us, as is determining the "real" temperature (i.e., Fahrenheit) when we see/hear it in Celsius. CA 2 east of Moncton was pretty rough hauling a large 5th-wheel trailer. 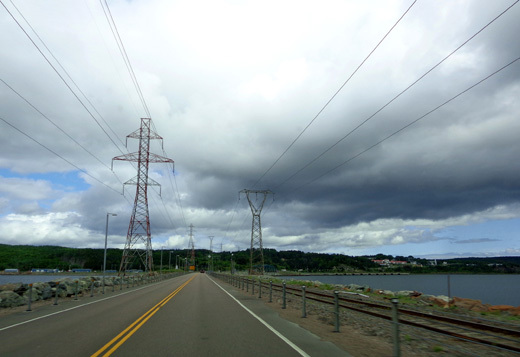 CA 104 and 105 in Nova Scotia were much smoother. That could vary from year to year, of course. CA 2 was all freeway. 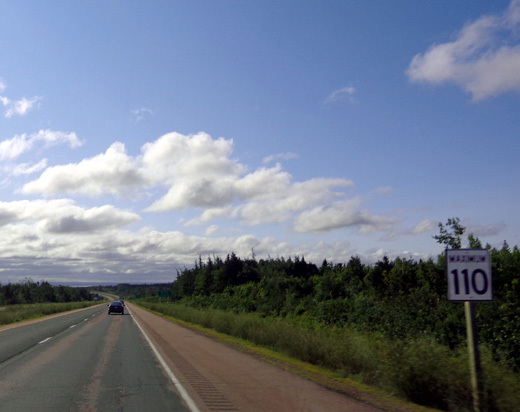 CA 104 was freeway to New Glasgow, then two-lane the rest of the way to Cape Breton, with lots of passing lanes up hills and freeway-type intersections at roads -- but people's driveways open right onto the highway. (That seemed odd.) 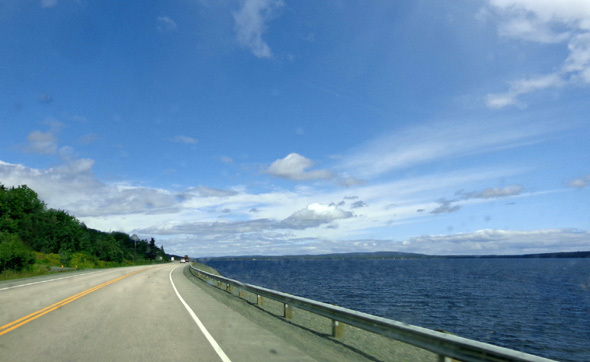 CA 105 was two-lane and fairly smooth to Baddeck. 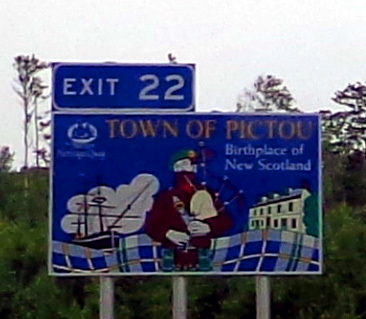 Nova Scotia has very colorful highway signs before each town or city. 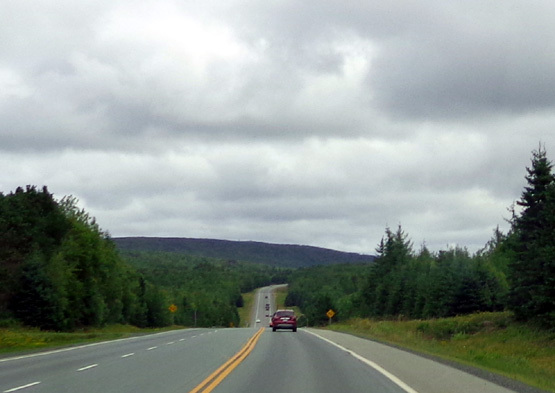 Traffic was moderate until highly-traveled NS 102 headed south toward Halifax. 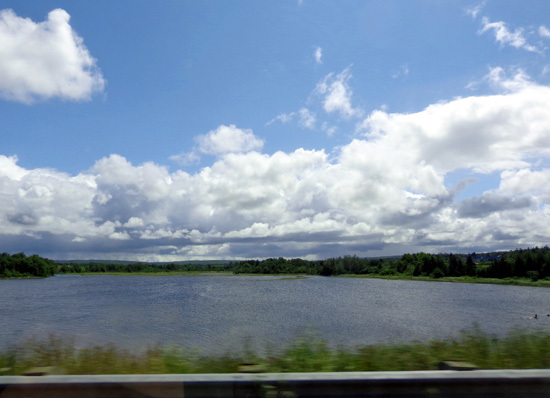 We saw lots of RVs until that intersection; most of them were headed to/from Halifax and not Cape Breton. Good! We left the campground in Moncton at 8:45 AM in sunshine. 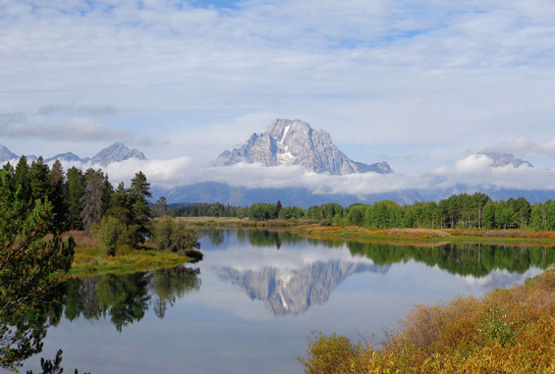 The weather was totally schizoid as we headed east throughout the day, with about a dozen brief rain showers followed each time by sunshine and billowing clouds. A little sun . . .
A little rain . . . 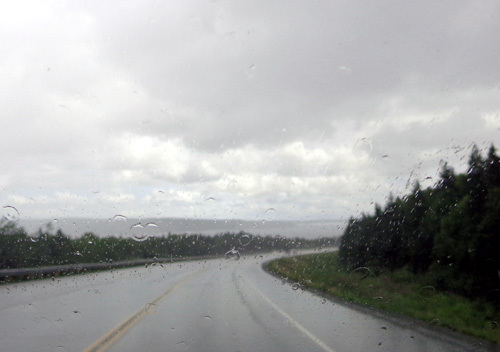 It was mostly sunny in Baddeck this afternoon. We got to the campground about 2:45 PM. Temps were in the mid-70s F. and it was very humid. Average low-high for Baddeck now is 55-73 F.
That place sets the gold standard for welcome centers. I got several maps and brochures and we were on our way again. 2) What was called a rest area at Westville, before New Glasgow (exit 21 on C 104). This was nothing more than a muddy truck stop. 3) An Irving/Circle K station at Aulds Cove to fill the tank before we drove over the causeway to Cape Breton Island (diesel @ $1.343 CA per liter). I loved how hilly this route was. It was also very scenic with so many conifer-and-hardwood forests, wildflowers, and bodies of water. 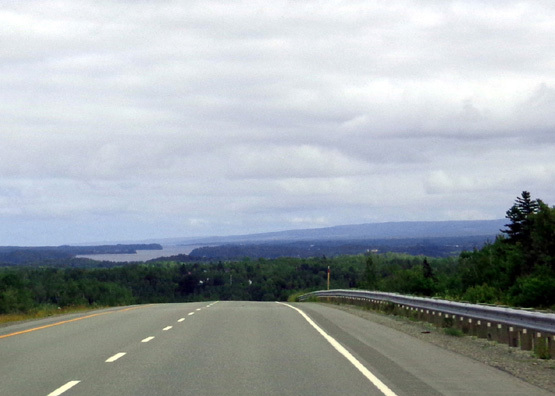 We could see a little bit of the Bay of Fundy at the New Brunswick-Nova Scotia border, Cobequid Bay before Truro, Northumberland Strait near New Glasgow, St. George's Bay and the Strait of Canso at Aulds Cove near the causeway to Cape Breton Island, and St. Patrick's Channel the last few miles to Baddeck. Close to the campground we passed the intersection with the scenic Cabot Trail, which makes a loop through the northern half of the island and Cape Breton Highlands National Park. We plan to do a driving tour on that route tomorrow. 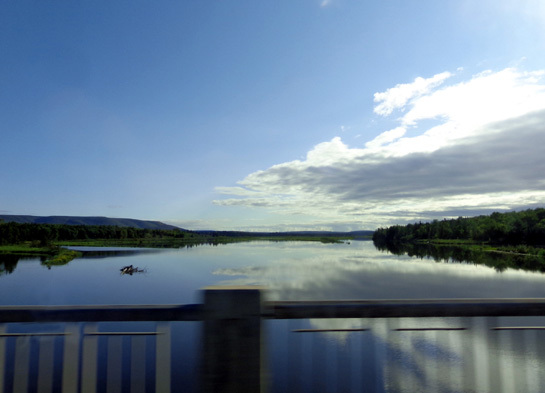 Soon after that intersection we crossed the wide Baddeck River . . .
One part of the hilly campground; our site isn't shown here.